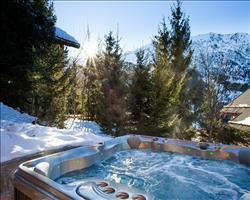 On a prestigious estate overlooking Meribel which is a 600m walk away. 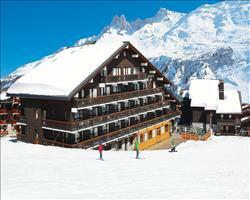 300m to the piste or 2 minutes by our Merishuttle chauffeur service. 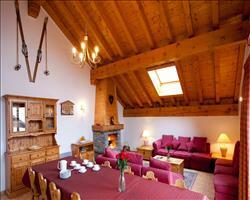 Ski hire at Indiana Lodge is provided by North Face who offer an in chalet fit service. Situated in the trees on the exclusive ‘Dou du Pont' estate, Indiana Lodge overlooks the centre of the village. 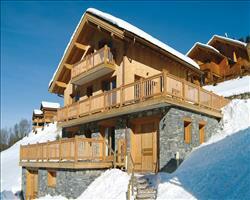 There are few other Meribel chalets to rival it in the resort located in such a prime location to rival it, being within a short walk of the resort centre and close to Meribel's main lifts and ski school meeting place. The living room has a delightful wrap around terrace and there is a sauna and outdoor hot tub, and all the toys including surround sound audio and heated ski boots in the morning. Each of the bedrooms and bathrooms has been individually themed to combine traditional craftsmanship with cool contemporary styling. The chalet sleeps 10 in five en suite bedrooms, but you don't have to book the whole chalet, in Indiana Lodge you can book by the room on all dates throughout the season. 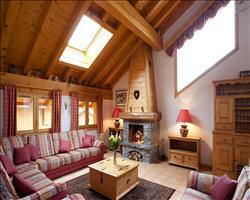 There are four Twin rooms and one Double to choose from, all with a balcony and en suite bath. (First floor) - Twin bedroom with balcony, en suite bath, hand basin and WC. Limited space for a cot. (First floor) - Double bedroom with balcony, en suite bath, hand basin and WC. Space for a cot. (Second floor) - Twin bedroom with balcony, en suite bath, hand basin and WC. (Third floor) - Twin bedroom with balcony, en suite bath, hand basin and WC. Limited space for an extra temporary bed or cot. (Third floor) - Twin bedroom with balcony, en suite bath, hand basin and WC. We update Indiana Lodge's details often, but facilities do change. e.g. some extras listed by the supplier as "free" or included might only be for the first time you use them, or for one time per party, then charged for further use. If any specific feature is essential to your holiday, make sure you ask us to confirm the details of it before you book your holiday. 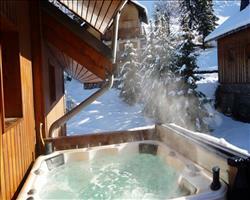 This package holiday to Indiana Lodge in Meribel & Mottaret, France departs Sunday 15th December 2019, for a 7 night stay on a "catered chalet" board basis. 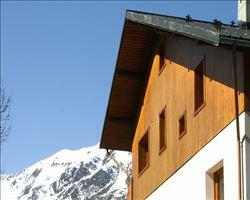 A local tourist tax (Taxe de Sejour or Kurtaxe) is levied by many councils in European ski resorts. It varies by standard and type of accommodation and is age dependent, so not everyone is charged. It's not included in the basic price of your holiday and is usually paid locally. For reference, the average charged in winter 15/16 was between 50p and £2 per person, per night. 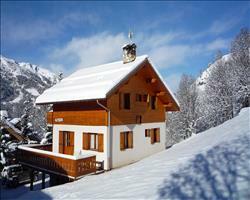 Meribel & Mottaret lift pass price last reported as €212 (adult 6 day). Ask for a quote when booking Indiana Lodge. 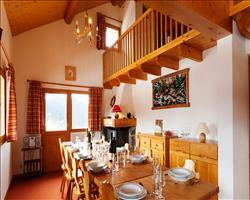 "My best week skiing yet.."
Great chalet, great hosts and great weather. Transfer from the airport was slow and inefficient and beds were quite uncomfortable. Everything else was fab. Notably strong staff, very helpful and keen to help. Very good nannies, Tasha and beckah, and excellent hosts, aiden and Anika. 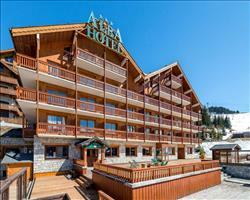 Very good quality chalet standard. Only problem was logistics of picking up which was consistently wrong and poorly communicated all week despite attempts to fix Overall very happy to recommend highly.